​"She cares about the well-being of everyone involved - parents, dog and baby - and can offer solutions to meet those seemingly disparate needs." I started teaching dogs and babies classes in 2001, when I was pregnant with my first child and Manager of Behavior and Training at the San Diego Humane Society. Along the way, dogs and babies became more and more of a focus until it developed into my primary expertise with 20+ classes per year and working directly with individual families to solve problems. I met Jennifer several years ago at a dog training continuing education seminar and could tell right away that she was smart and committed to helping families. After we connected, I became somewhat of a mentor to Jennifer as she was starting in the dogs and babies realm. I say "somewhat" because Jennifer is an accomplished trainer in her own right and is creative and thoughtful and certainly thinks for herself. I get a lot of out of our brainstorming sessions myself! We have stayed in touch and collaborated since 2010. New parents are surrounded by conflicting messages when it comes to dogs and babies. On the one hand, it gets brushed off as easy and nothing to worry about if only you follow some collection of "simple tips" and on the other is the inescapable undercurrent of, "What if the dog bites the baby?" No one wants to talk about that so parents are left to fend for themselves with incomplete knowledge and simply hoping for the best. What Jennifer understands and communicates so well is that parents can think for themselves and maintain a safe, happy household with dogs and babies when provided with information. 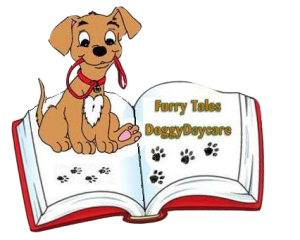 Information about reading dog body language, information about how to manage space for both dog and baby, information about "baby safe" training methods, information about building "dog safe" habits in very young children, information about increasing a dog's coping skills, etc. Jennifer grasped this long before she had her own children and now she has the added experience of living it herself and being able to encourage new parents with the message that, "You can do this!" Jennifer is educated and passionate about helping young families with dogs safely and happily incorporate new human baby family members. ​She cares about the well-being of everyone involved - parents, dog and baby - and can offer solutions to meet those seemingly disparate needs. I'd recommend Jennifer without hesitation. Everett Animal Shelter on March 6th, 2016. All I Want for Christmas... Just Ask the Dog! This Christmas I have only one wish. I live in a wonderful community and am surrounded by great people, but I wish they would let me have a choice. Let me explain. I’m not talking about a choice of which part of the sofa to snuggle on, although that would be real nice. And I’m not talking about a choice over which food I am always fed. Rather, I am talking about a choice on whether or not I would like to receive attention. Sometimes, dogs try to show that we are not up to “social hour” by making our body stiff, lean away, lift a front leg, show the whites of our eyes, and we will even wag our tail nervously and lick you a lot. I think people have it all wrong and think a lot of our licks mean love. I wish they would scan the rest of our body and realize that we are patiently requesting personal space. Don’t get me wrong, attention is a wonderful thing, whether it be affection from people when I am out on a walk, at the park sunbathing, or even with family that comes over to hang out, but you see sometimes I’m just not feeling up to being social. Some days I find a morsel of food flung from the highchair and because I couldn’t resist I have an upset tummy, so belly scratches aren’t such a treat those days. There are days that I am feeling sore from chasing off invading squirrels from the yard, and I think maybe the family could just be grateful for my service and let me take a nap in peace. Some days I feel physically good, but just want some me time. Besides, don’t you find it weird, and kinda rude, when children, and even adults, will just walk up and stick their hands in my face? I bet you wouldn’t like it either. I mean, unless their fingers are holding some bacon , I find it a little unsettling. And why can’t people understand that when I am up for socializing and turn my behind to them I am say’n scratch here? I mean, what’s up with that? They’re always aiming for the top of my head even though when I walk up to them, I turn around and present them my booty. I know, I’m blabbering now, but I think you get it. So this Christmas what I want, … and I think all other dogs want too, is to be asked our opinion on receiving attention. So if it be within your power Santa, please, this Christmas let everyone know how us dogs feel about being asked our opinion . ​I have written some general guidelines to make passing this information onto the humans easier. 1. Ask my guardian (owner) my name and if you can say hi. Many people know this one already, but sometimes my mom and I are in a hurry. ​2. Remain 5 feet away. I’m sure you are wondering why 5 feet. It’s because I know I can be irresistible at times, so 5 feet can quickly be shortened to 3 feet. I mean think about. When people talk to one another they usually have a bubble of personal space, right? 3. Say my name, “Bali” and clap your hands to get my attention. If you want to go the extra mile, to make me feel even more comfortable, you can turn slightly sideways and make minimal eye contact. 4. Now here’s the hard part. Wait! Waiting is what we appreciate most. Please give me a moment to choose what I’m feeling up to. If I choose to come towards you, please pet me 2-3 times on the region of my body I present to you. Then stop and see if I kindly request more love by nudging or leaning into you. If our community would know how to Ask the Dog I feel that many of us dogs would feel safer and not have to resort to running away, freezing in fear, or the awful part of having to bark , growl, or even lunge to get our point across. We feel awful inside to take it to this level and then people get scared of us. So Santa, please make my wish come true this Christmas so we can all have a choice to stay safe, and live in peace and harmony. Sincere thanks goes out to Madeline Gabriel (http://www.dogsandbabieslearning.com/) whose insights allowed “Ask the Dog” to strengthen families nationwide. Know a dog that gets a case of the crazies whenever the food dish comes out? How about those dogs that just might trample you to get through an opened door, or go berserk when they see you take the leash out. Think it’s cute? OR, would you like to be able to hold a hot cup of coffee and carry on a conversation knowing that your dog has manners, and would never do such a thing? In the world of canine behavior, we call this: High-Impulsiveness. Impulsiveness is the tendency for animals to simply act before they think. Dogs with high impulsiveness or low self-control tend to rush towards items they want (food, people, other dogs) and react in an extreme manner when excited (jump, whine, pace, bark, lunge, etc.). The more they practice acting impulsively, the more likely they will continue to act in such a manner. Furthermore, these dogs are unable to look to their guardian’s (owner’s) for direction, especially when they’re scared or distracted, and in times like these dogs can unknowingly place themselves and their beloved human family members into dangerous situations. What does a well-mannered dog, or a dog that controls her own impulses look like? • Voluntarily places all four paws on the ground, sitting, or lying down. * • Voluntary peace and quiet (no demand barking, whining). * (*Note: The dog is voluntarily performing these behaviors. Commanding only leads a dog to being dependent, as opposed to self-performing.) The following are some moments to incorporate impulse control into your family’s daily life. • receiving her food dish • attaching/detaching her leash • going through the front door • receiving affection • receiving her Kong • walking down/up steps Look closely at these actions and rate them on a scale from easiest to most challenging. Generally, it is best to begin impulse control training by working on the activity we would rank as easiest. For example, let’s say your dog is least aroused when going through the doorway; then that is the easiest activity, and your starting point. When working with doorways choose a doorway where your dog’s impulse control is strong. Maybe a closed bedroom door to start, working your way up to the front door which would often be more difficult (as this is where the yard, or park, or a multitude of fun lives). Take a deep breath and wait for your dog to voluntarily keep all four paws on the ground, or sit, or lay down. When they do, go to open the door the slightest. Now if your dog breaks out of position, quickly close the door while not saying a word. Take another deep breath and try again. You will see that over the next attempts the dog will gradually wait longer and longer for the magic door to open. Once the dog has passed this test, use a release word such as; “release, freedom, or let’s party” telling the dog that they are welcome to go. One thing to be aware of is extinction burst. Think of this as a temper tantrum that a toddler might throw when being taught to clean their room. It is a burst of emotion, preceding the breaking of the bad habit (its extinction). Extinction burst usually can occur when the dog is in the transitional period of trying to learn what to do in order to get what they want. An example of this would be a dog that normally barked and tap danced around her guardian (owner) to get the door opened, is now trying to figure out why her guardian is no longer “caving in” to her demands. The dog may really amp up her barking and dancing DEMANDING the door to be opened, but in time will learn that calm, well mannered behavior quickly gets her what she wants. This sounds simple, but in truth each home and each dog presents a new challenge. Since the goal is ensuring the rewarding of the positive only, and avoidance of the undesired behavior, just about everyone needs some outside perspective. This is where Pawsitive Transformation can help. Pawsitive Transformation can help you identify moments that can be “fine-tuned” and help you analyze the areas which are most challenging for your dog. Most guardians will need help in effectively communicating with their dog, and keeping their dog’s focus on their guardian. Also, knowing what the dog is saying though her body language can teach you when your dog may be feeling overwhelmed with the training process, leading to less frustration for all parties. Just remember, as with children, a dog’s manners taught at home shape their behavior outside as well. If you want a companion that is sociable and a pleasure to be around, even the best dogs will need some guidance. So when training your dog, begin at the beginning and teach them self-control. I have a good dog that’s for sure. She sits automatically when greeting friendly strangers, waits calmly for her meals, doesn’t pull on a leash, and may possibly tolerate our toddler pulling on her ears, hugging tightly on her back, and invading her space while resting. Even though I do have a “good dog” I am guiding our son to not take advantage of her nice-ness or her good qualities. I want to teach him ways to show love that dogs appreciate. You see, I know that my dog has back pain (diagnosed through radiographs) and most people know to never bother a resting dog and of course not pull on their ears, BUT, children do not, especially toddlers. Even if my husband and I think our son should know better because we have told him, “No! Don’t do that” many times before, we also know that toddlers like to exert their independence. “Purposeful defiance.” are the words our pediatrician used. A normal behavior yes, but when I heard these two words come out of our pediatrician’s mouth I thought, “Wow, exactly!” Toddlers test limits. We cannot rely on them waiting at the top of stairs, so we utilize a baby gate, likewise we should never rely on them alone to treat a dog, even a loved family dog, with respect whether we are around or not. When I’m out in the world I too often hear, “Wow, what a good dog! !” or "my child is really good with dogs". My stomach flips as I immediately see a child pushing a dog to what may be her limit. I think, “oh my gosh, somebody help this poor dog!” Doesn’t anyone notice the stress the dog is showing? Is today the day this dog can’t take anymore? The yet to be educated public is lulled into a false sense of security and continues on with lackluster supervision of how their children interact with dogs in a way that may be unsafe. What many forget is that all dogs, even good dogs, have limits to their tolerance. I do not know a single person who has immeasurable tolerance. Too many of my clients have stated, “The bite came out of nowhere,” followed by, “If I only knew then, what I know now.” I go on to say, that most dog bites are coming from “good dogs” -- dogs that have been pushed too far. Dogs frequently tell us, “Please stop!” or “I’m freaking out over here, somebody help!”, but these pleas are often overlooked by humans. These are the phone calls I receive. A growl, snap, or bite which was scary enough to warrant a phone call that the guardian is now wanting immediate training, behavior modification, re-homing, or euthanasia. Within the first initial consult I develop a plan for each particular family and provide ongoing guidance to help maintain that plan in their personal situation. Guardians that were once "supervisors" are turned into "guides" transforming doable, daily situations into a path for success. The family dog begins receiving great things especially when the children are around making noises, running, dropping toys. These great things (treats, toys, praise, etc.) are like adding money into her bank account if she had one. This bank account is improving her mental health and increasing her tolerance. Then, when the inevitable sippy cup falls next to her (surprise), toy flies across the room (frightens), or physical contact happens (hurt/pain) between toddler and dog, the dog now has a full bank account and doesn’t mind when withdrawals are made. Even the unwanted hugs that dogs receive from children can be pacified by keeping the balance high, this hefty bank account helps make everyone feel happy and safe. Indeed the curse of a good dog is one that many people would think to wish upon themselves. After all, we should all be so lucky as to have a well mannered companion enriching our lives. However, dog guardians with children can be lulled into a false sense of security and even those without children can find the dog they thought “The Best on Earth” may become a loose cannon within one trip to the park, depending on the situation of the dog that day. With mindfulness, empathy, and an educated/ observant eye we can prevent the gift of a good dog from becoming a curse. 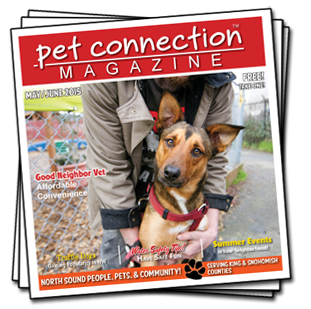 ​Pet Connection Magazine May/June 2015 issue. If you’re reading this I’m sure you are a dog lover. I am. I am also a registered vet tech, certified dog behavioral trainer, Mother, wife, and educator of canine body language. Why is knowing how to read canine body language important? Of course knowing how to speak dog will help build a stronger relationship between you and your dog, but it will also help to keep you and your family safer. After all we all buckle our seat belts when we go for a car ride, place new batteries in our smoke detector every 6 months, and lock our doors at night. The odds of being in a car accident, having a house fire or your home being broken into are slim but as a society we error on the side of caution. So why not learn how to stay safe around dogs… just to be on the safe side? Unfortunately a lot of us know someone that was bitten as a child. The child undoubtedly becomes emotionally scarred and sometimes even physically scarred. The dog now has a bad rap, maybe gets re-homed, or maybe lost her life because she could no longer be trusted. As I write these words, images come into my head that reiterate why I do what I do. I teach canine body language to children and adults. Knowing how to interpret canine body language is a blessing that can now keep my family, especially our son safe, and my dog, Bali, comfortable with her family. I want to teach this to our community so we all can be safe. A recent statistic states 50% of children are bitten in some form before the age of 12 yrs. With my son being a toddler we have many years to go in order to keep him on the safe side of that 50%. Knowing how to read when Bali and the countless other dogs in the community are feeling stressed, anxious, aroused, relaxed, etc. will keep both my child and my dog from becoming part of a statistic where everyone loses. WHEN DOGS ARE NOT FEELING HAPPY, OR COMFORTABLE WITH A SITUATION THEY MAY SHOW: “Whale eye” Excessive licking or a lick up and over the top of the nose Exaggerated yawn “Airplane ears” or ears out sideways when normally held erect on top of the head Tail between legs. When learning canine body language it needs to be looked at in context. For instance if we have just given the dog her meal she may lick her lips clean. If she hasn’t just eaten or received a treat and is licking up and over the top of her nose while a person hugs her, then we know she is not comfortable with the situation. Just like humans, dogs are able to express a wide range of quickly modified emotions. Anyone can go from happy to anxious and then back to happy again, and dogs are no exception. As a community I feel it’s important to witness when dogs are feeling a certain emotion because then we can react and adjust the situation to make it happier and safe. Now what to do when we witness a dog that is unhappy/uncomfortable with a situation? If the situation involves a child ideally we should redirect the child and dog away from one another in a positive light. Shoo-ing the “darn dog” away only teaches the dog that when the child is around them, the dog gets pushed off to the side. This could lead the dog to feeling as though whenever the child is around equates to getting yelled at or at a minimum excluded. Reprimanding the child for let’s say, pulling on the dog’s ear, only teaches the dog that kids cause pain and now we all get yelled at. This is where education through Pawsitive Transformation can help you. PT can teach you how to redirect your dog so they feel happy and safe as opposed to feeling like they were yelled at and then ostracized. Realistic suggestions are also made on how to maintain a daily, safe environment between dog and family. Pawsitive Transformation has three programs to best fit your family’s needs: Be A Star program is designed to educate children on dog safety with both the family dog, and the countless other dogs children will encounter. Children will learn: • The three-step method to safely invite dogs for petting • Where dogs like to be petted • How to tell when dogs are happy, scared, aroused, etc • When and when not to touch a dog • What-to-do-when scenarios Parent Empowerment Training (P.E.T.) was developed to help guide expectant parents in the safest direction possible to prepare dog and baby to live happily together. Problems that put young children at risk and cause even “good” family dogs to lose their homes are more common than you think, but are completely avoidable. Adult and Puppy Training incorporates canine body language education as well. Learning dog speak can help with building a stronger relationship with your dog as well as help with challenges such as fear, aggression, reactivity, separation anxiety, destructive and compulsive behaviors, and more. 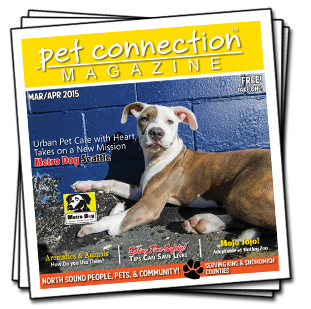 ​Pet Connection Magazine March/April 2015 issue. Pawsitive Transformation will be presenting an educational seminar on K9 Body Language at DogCity Doggy Daycare on March 29th, 2015. 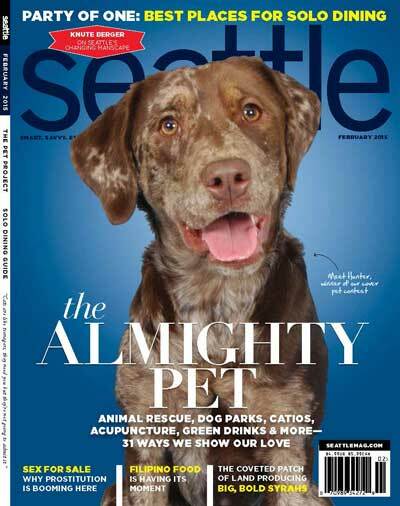 Check out Pawsitive Transformation in Seattle Magazine! Parent Empowerment Training You can be a new parent to your baby and keep your dog. 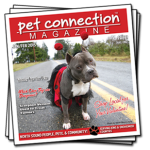 ​Pet Connection Magazine Jan/Feb 2015 issue. Out of the area, but not too far for Jennifer’s help. The idea of having a puppy had been on our minds for about a year, but when Monte, a nine month old German Short Haired Pointer actually came home with us, it was a different story altogether. As first time dog owners, we had fantasized about having the perfect dog, but had no experience to guide us, and Monte arrived with no such description. I called Jennifer in desperation about how to make his first night with us, “the new family,” the least disruptive for everyone. Jennifer was very forthcoming with information about how to transition the dog smoothly and how to start out on good terms. After the first night passed I was relieved, but my assessment of what Monte lacked in order for Antonio and I to enjoy him as our pet, was five plus items long. There was no room for having an untrained dog in our lives. I emailed Jennifer again. I told her about the issues, and our tentative plan to send the pup off to doggy boot-camp. Monte was a door darter, a leash puller, barked at strangers, and jumped up on people. The idea of spending $2000, sending Monte away to doggy boot-camp for two weeks, and having him return with all his problems worked out sounded worth it. Jennifer kindly looked into the facility we were considering and made sure we knew what types of training they subscribed to. After speaking with Jennifer, Antonio and I came to the agreement that it would be in our best interest, and for lasting results, to train Monte at home throughout his life. We came to accept that our dog was in transition and Monte would need not only our help, but Jennifer’s personalized attention to be all that we wanted him to be. Jennifer helped us to determine where the behaviors were stemming from, we received education about how to address each issue, as well as numerous educational links to some of the worlds best on dog training and transformation. Because we do not live in the same area as Pawsitive Transformation, Jennifer helped us via Skype and through email. Every interaction we had with Jennifer was extremely informative, and we were continually impressed with her consideration for the use of humane and positive reinforcement techniques. It has been invaluable to have such a mentor in our lives for the sake of Monte and us. We cannot thank Jennifer enough for all the help she gave us during our times of need and we are happy to know she is just a phone call away for future dog training or care tips that we will invariably have in the future. Thank you for helping us to rear an obedient, happy and healthy dog! Jennifer Anderson has been our dog trainer since they day we rescued Seeley from the pound over 5 years ago. We have an unusual and hectic household which includes a young autistic man, who I adopted several years ago. There is also my adult daughter, my husband, and myself. We have about 5 acres and run a small pet rescue in Northern California, and in addition to our 22 animals, we foster dogs, puppies, cats and kittens. When we got Seeley he was extremely high strung, almost uncontrollable and had to be leashed at all times when outside or he would bolt and run off. He is also blind in one eye, adding to the challenge of training.him. Literally the first night we had him we called Jennifer, and got some tips over the phone to help until she could come to our home a few days later and work with all of us. The information she gave us and the work she did with us as a family was amazingly successful. The fact that she uses a positive, compassionate approach, with reward more than reprimand was very appealing to us. We too believe animals should be treated with love and respect and not abuse or cruelty. That she doesn’t use pinch, pronged or shock collars really appealed to us. Especially when she explained the damage they can do to a dog. She showed us how to change Seeley’s behavior in a loving way. Even after Jennifer moved away we continued to use her knowledge and wisdom with numerous animals successfully. She has advised us on several occasions with dogs in our animal rescue. On one occasion she helped advise us with an aggressive 6 week old puppy that other dog trainers wanted to euthanize. He is now an awesome, year old, devoted pet in a house hold with other animals and children. Literally the work she does transforms the dogs into amazing family members. We continue to use what she has taught us with every animal we rescue. We have truly never met anyone like her, and are thankful for her. “I’m a veterinary technician. And being a veterinary technician in the family means always being the one that everyone calls when they need medical advice, questions answered, or toenails trimmed at family gatherings. For years I would help care for my Aunt’s dog, Brutus, by trimming his toenails, cleaning his ears, and giving advice to his mom. Brutus, being a Bull Mastiff, would give sloppy wet licks, leaving drool streaks on your clothes, and turn into a 115 lb. lap dog after his nail trim sessions! My big buddy was aging gracefully and I would love to spend time at my Aunt’s to see his drooling face. Then the unexpected happened. During one of my visit’s he was not the ‘normal loving Brutus.’ My aunt’s dog, that I have known since a puppy, went after me to try to bite me while I was petting him standing in the kitchen. I was completely shocked by his behavior and my Aunt and Uncle were horrified. They panicked, not knowing what to do and thought about their grand children being in the other room. How could a dog who loves and has known me his whole life turn on me like that?? I then contacted one of my former co-workers. 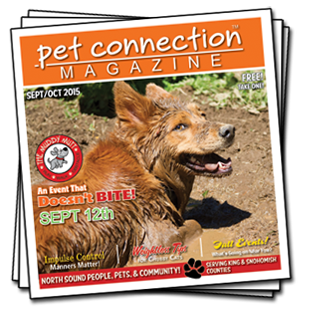 As a Registered Veterinary Technician and a Certified Dog Trainer, Jennifer Anderson had a positive outlook on the situation. She started off by asking pertinent questions to gather as much information as I was willing to give her. After the phone consult (I live in Ohio and at the time she was working in California) and finding out he has been having a difficult time getting up from laying down, she first recommended my aunt schedule an appointment with Brutus’s veterinarian for a physical exam. She advised my Aunt to rule out any medical problems before any training or extreme measures were taken. Jennifer mentioned that the DVM may want to perform diagnostic tests, such as radiographs and blood work to rule out a health condition and/or pain involvement. Come to find out Brutus had not been to the vet in over two years, which is a long time for an older, large breed dog. After the vet visit coupled with Jennifer’s advice, I had to let my Aunt know that Brutus was suffering from severe, bilateral hip dysplasia. Brutus was in pain trying to tell us the only way he knew how. Now Brutus’s pain is being managed with prescribed medication to make him more comfortable. Due to his age he is not the best candidate for corrective surgery, but his medication brings him relief and we have not had a scare in his behavior since. Sarah, in her first year, was a handful to say the least. She was so happy and playful and full of energy. You might even use the term “crazy!” We realized early on that she needed professional guidance in order to gain some good manners. We were so fortunate to be introduced to Jennifer at the daycare we took Sarah to frequently. It was great that she was able to have fun and socialize at daycare and also learn new habits. Jennifer was so professional both in dealing with Sarah and her “Mom and Dad.” She explained what her goals were for Sarah before each training session and summarized Sarah’s progress when I picked her up, giving clear instructions for “homework” until the next session. Sarah loved her sessions with Jennifer (and loved Jennifer!) and I believe made rapid progress in her training. Loose leash walking was a very important ability, especially as she grew older and stronger, and also Sarah now waits as I open a door until I allow her to go through. I was able to use Jennifer’s training methods to teach Sarah to wait in the car until I got out and permitted her to exit after me. I believe Jennifer has a very special ability to communicate with dogs. If we are fortunate enough to be close to her in the future, Sarah will continue to have Jennifer as her coach! Jennifer was our trainer here at Furry Tales for several months, before moving to Seattle. We chose her because we truly believe in her positive reinforcement techniques. She did a fantastic job here. She worked with several of our clients, ranging from puppies to dogs with issues. She had great success with all and her methods were very well received by the clients. We had excellent feedback from those that Jennifer worked with, stating positive and lasting results. I would have her back on the team in an instant. I highly recommend her training techniques. I had the pleasure of working with Jennifer when she was a veterinary technician at our general practice, which then transitioned to a 24 hour specialty practice. She is very personable and has a knack for reading dogs and people. She has a passion for all things dog – not just the behavior issues at hand, but the whole dog. She is very attuned to the importance of medical problems as contributors to behavioral problems, and knows when dogs require the skills of a veterinary behaviorist for serious aggression cases. She is a great asset to the dog training community! “My dog Milo was a regular at Furry Tales Doggy Daycare and that’s where I met Jennifer who was working as the facility’s behavior specialist. Milo and another daycare dog were in a scuffle prior to our meet, which made me really concerned, so when I met Jennifer I thought it be best to seek her help. She provided Milo and I with in daycare training, and a private home consult, and a few group classes. Together we worked on various things I felt could be improved upon. Training, coupled with switching Milo from a choke chain to a no pull harness and flat leash, had Milo walking better on a leash in two weeks. While Milo went on walks he would often pee small amounts frequently and Jennifer educated me on what urine marking means and how to stop it. Milo again improved. Jennifer also recommended increasing Milo’s physical exercise to help make him feel better. Milo was very reluctant to exercise and after Jennifer heard of this, she recommended a veterinary exam (she’s a vet tech too) to rule out pain, discomfort, or an overall health problem. I was glad I took her advice on it because poor Milo was allergic to so many things and this was also causing him pain in his paws. She also taught me how to read Milo’s body language and through this education I was able to learn that Milo was fearful under certain circumstances. Particularly when male dogs invaded his personal space. Now knowing how to read what Milo is saying and having his feet feel better he can now relax more. Also the three of us learned a cool trick called Relax on a Mat. Milo now feels relaxed when he’s on his mat and goes to this mat in the mornings to relax instead of following me around as I’m leaving for work. Is that a treadmill in the dog kennels? Are we training for the humane society Olympics? In a manner of speaking, yes! SHS dog trainer, Jennifer Kobie [Anderson], is using exercise equipment to help long-term residents and hyper-active dogs run off some of their excess energy so they are better focused during their behavior modification sessions. “When dogs wear themselves out physically they are easier to manage, and therefore easier to train,” says Kobie [Anderson]. If you’d like to help dogs like Sassy become “Canine Good Citizens”, please consider making a donation to the SHS Shelter Dog Behavior Modification Program. For more information contact us at humane@sequoiahumane.org, or simply write “dog training” in the memo field on your donation check or receipt. The Labrador-mix puppy found with a broken leg, sealed in a plastic bag and left to die in a Dumpster was released from the veterinarian’s office Monday. Friends for Life President Kristen Kemp said the puppy was given to Jennifer Kobie [Anderson], of Eureka, who will foster the dog until it’s healthy enough to be adopted. ”Willie,” as the dog has been named, is in good shape and is recovering nicely from the surgery to repair his leg. Read more.